♦ YABS - YABS stands for Yet Another Black Songbird. This is more of a skin rather than a add-on. 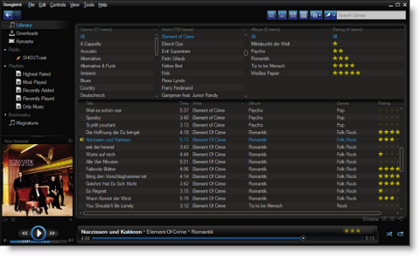 Installing this add-on gives a black look to Songbird media player and many more tweaks that work. ♦ Concerts - Using this add-on you can see when your favourite artists in your Songbird library are touring in your city. Concert and ticketing information is powered by Songkick's API. ♦ Fasterbird - This add-on allows you to tweak many network and rendering settings such as simultaneous connections, pipelining, cache, DNS cache, and initial paint delay thus increasing the dynamic speed. A popup blocker for popups initiated by Flash plug-ins is also included. ♦ MTP device support - With this add-on, users will be able to transfer media files to MTP devices, delete and update files, create and manage playlists and manage multiple MTP devices at once. This add-on requires Windows XP SP2 and above with Windows Media Player 11 installed. ♦ SHOUTcast Radio - This add-on provides a Songbird-native interface for browsing and playback of SHOUTcast Internet Radio streams. You can bookmark / favourite stations, filter / search, and view them by genre. ♦ Hype Machine Site - This extension creates a web playlist based on the RSS playlist file on each Hype Machine page. It also adds the Hype Machine site as a search option. If you liked this article, then you might be interested in reading the first part of the article.